As concrete ages, it deteriorates, resulting in discolored, stained, cracked, chipped, weakened and porous concrete surfaces. Weather, wear, moisture, freeze/thaw, and earth movement are contributing factors of gradual surface deterioration. The Concrete Solutions® line of award-winning products have been used by decorative concrete resurfacing industry professionals since 1986. Our goal is to provide quality concrete resurfacing products and services such as monthly training programs, ongoing specialty workshops, and continued product development, research and testing. 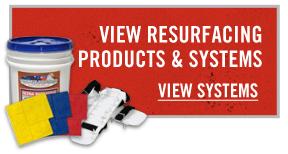 We've spent the last two decades developing products and systems that restore and resurface concrete to its original condition and at the same time, provide customers with a more decorative solution. After years of research and millions of square feet of on-the-job testing of Concrete Solutions products in virtually every climate condition throughout the world, we developed a systematic approach to concrete resurfacing and beautification. Our products are continually used in a variety of high profile commercial and many residential projects and are developed to stand the test of time. In an effort to diversify and develop the Concrete Solutions line of products, Rhino Linings Corporation acquired Concrete Solutions in May 2011. Concrete Solutions products are now manufactured and sold under Rhino Linings Corporation in addition to the Rhino Linings line of polyaspartic floor coatings.